Perfect for desktop or counter retail, POS, pharmacy/library applications. 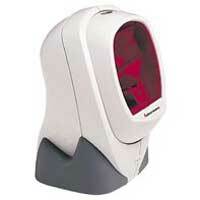 Access the complete Maxiscan 2220 Fixed Scanner product profile. Designed for fast, hands-free scanning on a counter or desk, the Intermec Maxiscan 2220 is a high-performance, cost-efficient solution for omni-directional pass-through scanning. Mounted on a rubber base to provide secure standing, M2220 features and adjustable scan area, a two-step sleep mode, and a universal interface system that connects to hundreds of PC's, cash registers or other terminals. The Intermec MaxiScanTM 2220 is a versatile omni-directional scanner designed for use in retail, POS, automated healthcare, library and other applications. With its compact design and flexible operation modes, it's a great choice for a variety of businesses. Hands-free scanning is easy using the 2220 (with its secure rubber base and adjustable rotating head) on a counter or desk. The 2220 packs all the scanning power you'll need, despite its compact dimensions. Smaller than a 6-inch (14.2cm) cube, the MaxiScan 2220 performs a full 20-line scan pattern with a 20cm adjustable depth of field and 20cm2 scan zone. Intermec's MaxiScan 2220 offers built-in reliability with a scanner window that's replaceable in the field for quick repairs and a two-step sleep mode with separate laser and motor timeouts to conserve power. Like most Intermec scanners, the MaxiScan 2220 comes with EasySetTM setup program for fast on-line or off-line configuration. A universal interface system allows connection to PCs, cash registers or other terminals simply.